Fancy soap. Shmancy toothpaste. Instant “good hair day” pomade. A tool kit that lives in your bathroom cabinet, not the garage. 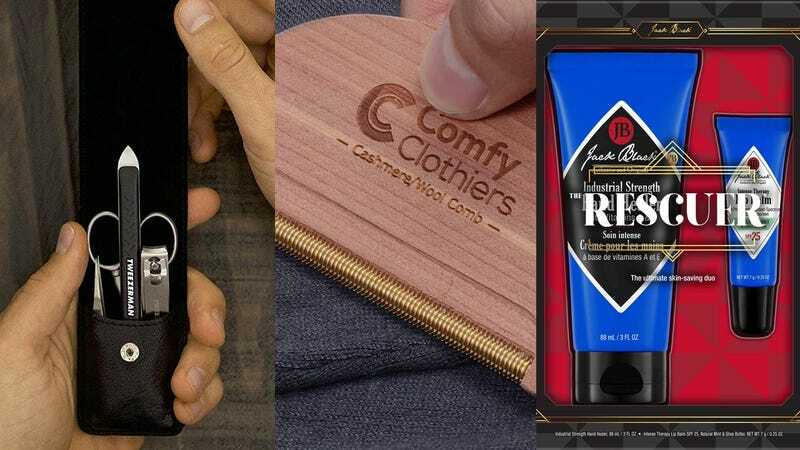 Grooming stocking stuffers are one of our favorite gift ideas for guys because they hit that sweet spot right between playful and practical. Because, like, sure...everyone needs body lotion (snooze), but when it’s from a luxe brand they’ve only ever seen in hotels, or laced with CBD? Suddenly it’s a fun, thoughtful gift they’ll be thrilled to receive. These grooming stocking stuffers are sure to please any guy on your holiday shopping list, from the new-ish Bumble guy whose chapped lips you’re somewhat reluctantly kissing to the live-in love who’s especially meticulous about maintaining his perfectly undone ‘do. Okay so we know this isn’t technically a grooming gift for your body, but it is a grooming gift for your apparel, and that’s important, too! 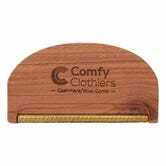 Sweater combs are amazing little tools that, with a few quick brushes over problem areas can remove pilling, lint and those annoying fuzzies that make your knits look worn out. Voila, you’ve groomed your sweater back to life without a trip to the dry cleaners, and that in itself is a gift. Like a bar of soap, the idea of gifting someone toothpaste is not all that special or particularly “gifty.” But this isn’t an everyday tube of Crest from the drugstore. (Shoutout Crest we still love you.) This Marvis toothpaste comes in an Instagram-friendly silver apothecary tube and will look really nice sitting on the side of his sink. It’s made in Florence for god’s sake! What’s more fanciful and gift-worthy than that? Listen, we know bar soap isn’t the most glamorous gift out there, but hear us out! Treating a loved one to something they wouldn’t buy for themselves—like, yes, a $12 bar of handmade soap—is a simple and effective gifting tactic. It’s also a thoughtful move if he’s already a “bar soap guy” as opposed to a “body wash guy.” Upgrade what he already likes and uses to something better, rather than trying to convert him to your side of the shower, as it were. This bar from Townsend Bay will make him smell like a clean, cozy, spicy man, and honestly who doesn’t want that? Men often ask us what we notice first about their grooming habits. And it’s not your lush, full beard or your musky cologne (though we do appreciate both)—it’s dryness. Dry hands and dry lips are uncomfortable to touch and only get worse during the cold winter months. Luckily, both are easy to fix with a rich hand cream and a lip balm with shea butter. Trust us... Proper hydration is a game-changer when it comes to impromptu mistletoe moments and cuddling all those little nieces and nephews over the holidays. Whenever we see a guy with errant eyebrow hairs or nails that have been allowed to grow just a bit too long, we assume it’s because they just don’t have the proper tools. (We’re right, right?) You’d be surprised how easy it is to keep those little grooming annoyances—like mischievous nose hairs and angry ingrowns—at bay when you have what you need to tame them. 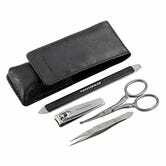 This kit comes with tiny scissors, sharp tweezers, a heavy-duty nail clipper and another multi-use nail tool, which makes it a perfect starter kit or upgrade for your favorite guy (or you)! Is there a guy on your list who’s extremely well-coiffed? Or maybe one whose mane you wish was a little more tamed? Put a little bow on top of this grooming cream and pop it in his stocking. This one from Saturdays NYC is water-based, so it’s nice and light and easily rinses out in the shower. Plus, it’s got a natural finish so you don’t get that overly shiny or overly-mattified look that comes with other pomade-style hair products. Any guy with sore muscles, irritated skin or even just a mild curiosity in what all the CBD fuss is about lately will appreciate this soothing body lotion. CBD is believed to calm redness and inflammation, deliver great moisturizing effects and even usher in relief for muscles in pain. Lord Jones is one of the more well-known entrants in the CBD craze, known for their CBD-infused body products, tinctures (the stuff you can literally drip into your mouth or add to drinks and ice cream!) and candies you probably shouldn’t keep out on your desk at work. As with most CBD-infused skincare, none of these products contain THC (the psychoactive ingredient in marijuana) so you can easily and safely buy ‘em online no matter where you live.